Do you think your dog has what it takes to be the next Hollywood star? Looking for something fun to do with your pooch? We recently looked at ways to train your cat and now it’s time to cast our eyes towards their canine counterparts. 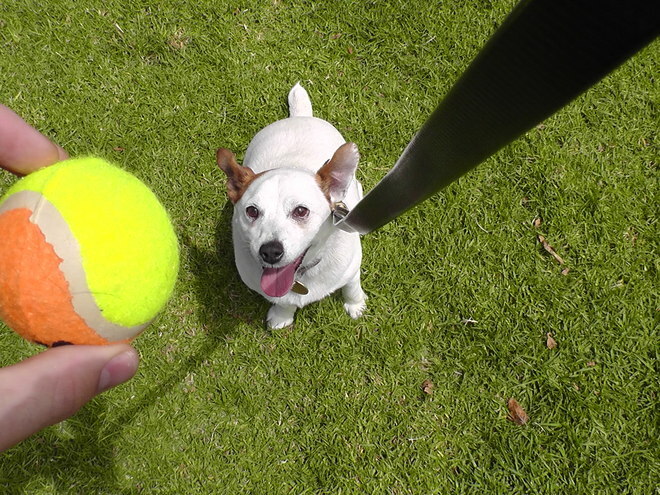 Dog trick training is a great way to really interact with your dog and training helps to enhance the bond between you. Teaching and performing tricks are a great way to give your pooch confidence, make them happy and provide an outlet for some of their energy. When teaching your dog new tricks, try to keep it simple and use a step-by-step process taught in a short, fun and focused session. Train in short sessions every day and once your pooch has fully mastered and polished the trick, you can move on to something new. All dogs are different, so find what really motivates them to work — it could be their favourite toy or maybe a delicious treat. Using a positive reward based training method, you and your dog will soon be wowing your friends with some great new tricks! Bow: Start with your dog in the stand position in front of you. Let your dog sniff the treat in your hand and then bring it down to the ground underneath their nose. As your dog reaches to get the treat, they may try to drop so slip your hand under their belly to hold them in the position of a bow. Once they are in the position — front paws down and rear end up — give the command of ‘bow’ and reward. Spin: This is a great trick as a warm up or to help dry off wet paws before your dog comes inside. Start with your dog in a stand position with the treat in front of their nose. Slowly move the treat toward the side of your dog’s head so they turn their head to follow it. Keep moving the treat around in a circle so your dog will need to spin their body to keep track of the treat. Once your pooch has completed the full spin, give the command ‘spin’ and reward. On your mat: It’s quite easy to teach your dog to head to their mat or bed for a bit of quiet time on command. With their attention on you, start by luring them over to their bed with the command “On your mat,” asking them for a drop when they are on the bed and then praising and rewarding the behaviour. As your dog starts to get the idea that the command means go to your bed, you can gradually add some distance between you and the mat. Send your dog to their mat from a distance and then either throw the treat to them, or walk over and reward them.